One Pot Wonders make my world a happy place and my friend Emily from One Lovely Life is here sharing an amazing looking dish, just in time for cool fall weather! Take it away girl! ‘Tis the season friends! No, sorry, not THAT season. ‘Tis the season for stews, soups, and one pot meals. 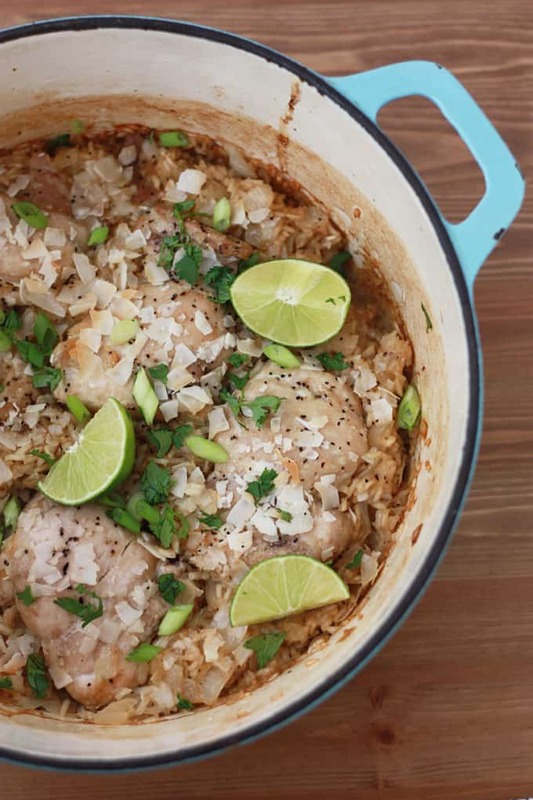 We didn’t have it often growing up, but some Sundays my mom would put together a pan of chicken baked over rice. I remember feeling a bit weird that the chicken had bones in it (oh, the horror! ), but I also remember LOVING the rice. 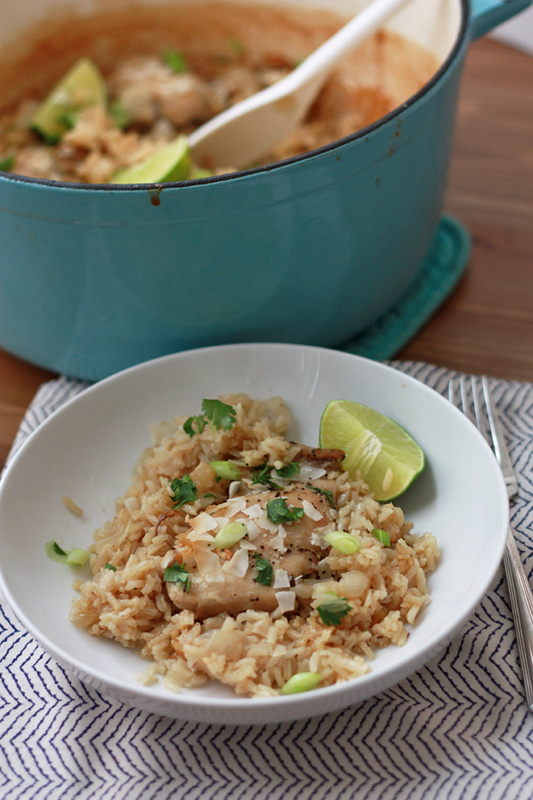 There’s just something magic that happens when you cook chicken over rice. All the glorious, succulent flavors meld together to create something so mouthwateringly amazing you find yourself going back for just one more bite about seventeen times. This is one of those recipes. It’s a step up from cream of mushroom soup, but it’s just as simple to put together. 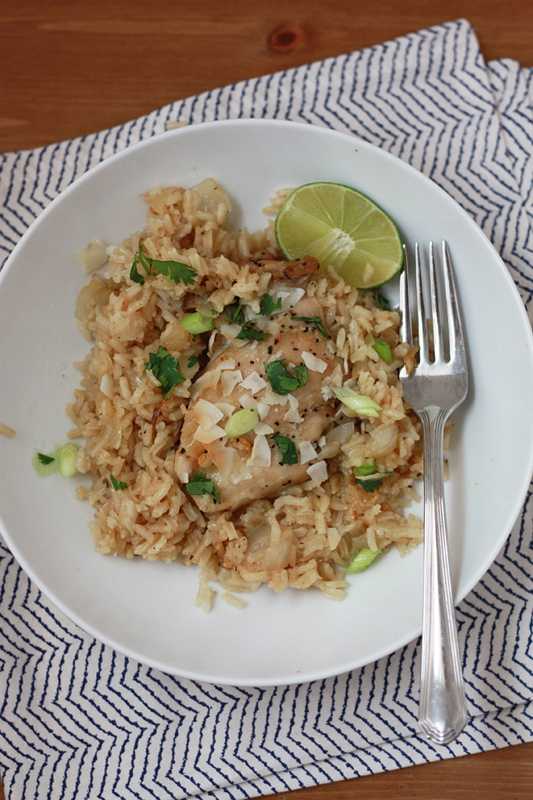 Creamy coconut milk, a subtle bite from the ginger, a little sweetness from the onions, and just a little brightness from the lime wake your palate up and will keep you coming back to this dish over and over again. I used boneless, skinless chicken thighs here. I can find organic ones at a much better price than I can ever seem to find chicken breast, and they’re much less fussy than roasting a whole chicken. It’s also really hard to completely overcook them, which gives you tender, delicious chicken! Win for everyone, I say. The rice is so, so good. For picky eaters, you can try grating your onion rather than dicing it. It’ll melt right into the rice. Just dice up the chicken for little ones before serving, cook up a green veggie as a side dish (broccoli or green beans are nice), and you’ve got one easy meal. Heat a drizzle of olive oil in an oven-safe Dutch oven or pan. Sprinkle salt and pepper over chicken and brown the chicken in oil for 3-4 minutes per side. Remove from the pan. Add onion, and ginger to the pan. Heat until tender and translucent. Pour coconut milk and broth into the pan and stir to scrape up any browned bits. Add rice and stir to coat. Nestle the chicken into the rice mixture and sprinkle with coconut. Add a tight fitting lit to the pan. Bake at 400 degrees for 20-25 minutes, or till rice is tender and chicken is cooked through. Sprinkle green onion and cilantro over all, then squeeze lime juice over everything. Doesn’t that look amazing. Coconut milk, ginger, and cilantro are some of my very favorite flavor combos. This looks delicious, I’m going to make it for my Friday evening meal since I never got that far in my menu planning…haha. Could you make it in a crockpot? Hmmm. I don’t have much experience with rice in a slow cooker. Do you? I’d be nervous about it cooking too long! Would brown rice work well with this recipe? What did you use? Is also stay away from jasmine rice (the flavor would compete here), but long or short grain white rice is your best bet. guess I should have scrolled through the comments first! I currently have the dish in the oven with brown rice! Just checked at 20 mins and the rice is no where near done!! Um…do you need to put the lid on the pot when you put it in the oven? Dummies like me need this in the directions. Cuz my rice ain’t cooked . . .
Oh no!! Yes, it does need a lid. I changed the recipe. Your willingness to try it out has forever corrected the mistake for the world. Thank you for being the guinea pig. I owe you a bag of rice! This reminded me immediately of Mark Bittman’s Chicken and Rice the Easy Way (Google it, it was published in the NY Times) – do you know it? Everyone should learn this basic toolbox recipe! Busy mamas, working singles, college students on their own for the first time, (or even better) older kids just learning to cook – utterly simple almost-one-pot recipe with real ingredients, honestly 30 minutes start to finish, and you can vary it endlessly with spices, herbs, vegetables, sauces etc. 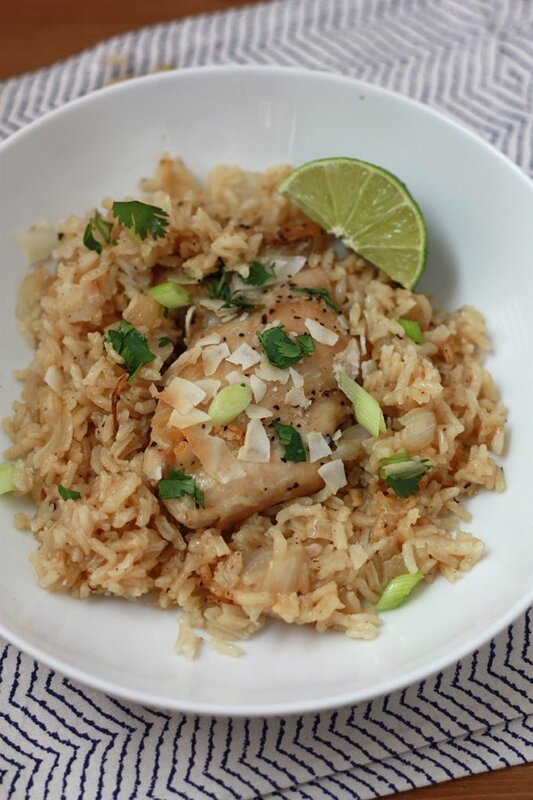 It has a lot in common with this recipe but does not bake, you coat your dry rice in hot oil in your pot and pour separately-boiled liquid over it and the chicken, simmer for 20 minutes, and it comes out beautifully. I’m going to use these ingredients with that method and see how it comes out! THis looks amazing….have you tried freezing it before or after cooking so it can be ready quickly?